The South Bay is our favorite part of Los Angeles. The South Bay in Los Angeles is home to several cute little beach towns, such as Manhattan Beach, Hermosa Beach, and Redondo Beach, as well as the beautiful high bluffs of Palos Verdes. It’s where we always stay when we’re in Los Angeles. It’s conveniently close to LAX, and removed from the crazy Los Angeles traffic hell. What’s more, Manhattan Beach, Hermosa Beach, and Redondo Beach are all connected by a wonderful bike and walking path along the beach known as The Strand. Walking along The Strand, you’ll find everything you’ve ever wanted out of your Los Angeles beach experience: tan, fit people playing volleyball; long haired dudes surfing sick waves; chill bros whizzing by on rollerblades carrying Starbucks. It’s classic Los Angeles. Not only are these towns home to great beaches, good surf, plenty of sunshine, and delicious food, they also have a variety of local craft breweries and tap houses! So we figured, what’s the best way to visit beach towns? By bike, of course! And thus, The South Bay Craft Beer & Bikes Bar Crawl was born. The self-guided tour we’ve laid out below makes a great day long date for two (or like, your entire group of friends). It takes you to 8 bars and breweries in 3 towns: Redondo Beach, Hermosa Beach, and Manhattan Beach. And the best part? The South Bay Craft Beer & Bikes Bar Crawl can be done for as low as $100, including bike rental and so much beer! Oh and did I mention you’ll sample at least 29 beers? You might want to split a couple of those growlers. Hey, we’ve created a super handy FREE downloadable Google Map & PDF for the South Bay Craft Beer & Bikes Bar Crawl. It’ll make this whole drinking beer and biking thing a lot easier, trust us. Enter your email address below to have the map delivered straight to your inbox. Planning a trip to Los Angeles? Here are some of our favorite spots just a few hours north of LA along the beautiful Pacific Coast Highway. Without further ado, we present to you our Los Angeles Craft Beer & Bikes Self-Guided Bar Crawl. The South Bay Craft Beer & Bikes Bar Crawl – SBCB&BBC for short (okay maybe the name doesn’t work as an acronym) – starts in one of the larger South Bay beach towns, Redondo Beach, located just north of Palos Verdes. Lia’s Dad grew up in Redondo Beach. Which isn’t really that interesting, but it does give us sort of half local’s cred, because Lia’s been coming here for her entire life to visit family. Also, her dad still knows the location of every Starbucks and surf shop in town. Yes, my father-in-law grew up surfing, too. We’re all California stereotypes here. Redondo Beach was home to the filming of the classic television series, Baywatch. Fox’s The O.C. (which everyone knows is way better than Baywatch) was seen filming at Redondo Union High School, Redondo Beach Pier, and local parks. The area of Redondo Beach that starts in Palos Verdes is known as “RAT” (Right After Torrance) Beach. Cute. Redondo Beach was described “The Gem Of The Continent” in the Los Angeles Daily Herald in 1887. Aww, that’s sweet. Chill vibes. Anyway, all you really need to know is that there’s a sweet pier, some docks, and a bunch of great places to drink craft beer. Before we can start the South Bay Craft Beer & Bikes Bar Crawl, you’ll need to park your car and rent a bike – both in Redondo Beach. We recommend starting early, like around lunchtime. Look for parking in Redondo Beach near the bike rental spot that we recommend, Perry’s Cafe and Beach Rentals*. Conveniently, you can also get a delicious brunch at Perry’s before you rent your bikes! Check out the breakfast menu and the bike rental prices. (If you’re rad and have your own bike, just skip to step 2 and park nearby.) After a hearty brunch (the better to help you soak up all the craft beer you’re about to drink), rent your bike (better make it an all-day or 24 hour rental, just in case) and begin the half-mile jaunt to the first stop on The South Bay Craft Beer & Bikes Bar Crawl. Don’t get excited. This is 2 flights. Also, friendly advice: don’t start the day off with 2 flights. Your first stop for beer is the Redondo Beach Brewing Company. While the name might be a slight misnomer (they don’t actually brew their own beer here), the Redondo Beach Brewing Company has an impressive beer list with about 40 taps, most of which are from Los Angeles or nearby. The vast selection ranges from sours, to Belgians, to porters and stouts. A flight of 4 beers at the Redondo Beach Brewing Company costs $11. Once you’ve finished your first flight, hop on your bikes and head to the next spot. As The Strand becomes the harbor, you’ll be met with dozens of boats to the left and a parking garage on your right. Lock your bike up in the rack and head down a set of well marked stairs to the docks, where you’ll find your next two stops. Your second stop on the South Bay Craft Beer & Bikes Bar Crawl is King Harbor Brewing, whose in-house brewed list of craft beers is packed with hits. Your first thought might be “This place is small. They brew here! ?” Well, not here, exactly. This is the tasting room. The actual brewery is located about two miles away. But don’t worry about the specifics. Just focus on the beer. There are 16 locally brewed craft beers available on tap. The flights here are “Choose Your Own Adventure” and the price is scaled depending on the beer. You can pull off a flight here for $12 and up. One of the most popular craft brews from King Harbor Brewing is the Coconut IPA. I think I should confess something: I’m not that into IPAs. I know. I can already feel my friends in the Bay Area disowning me. Look, they’re usually too floral, too bitter, and lack real complexity outside of the hops of choice. Bearing that in mind, I LOVED the Coconut IPA from King. It has a toasted coconut taste, with the floral quality of IPA, and a lighter body. It’s the perfect beach beer. Darkness Before Dawn: A very dark, full-bodied creamy stout. Blackberry Before Dawn: A very dark, full-bodied creamy stout made with blackberries, which add a slight tartness. Naja’s Place has gnarly taps and surfboards on the ceiling. Rad, dude! A grueling 1 minute walk down the Redondo Beach boardwalk puts you at Naja’s Place, where you’ll see the most beer in one place on The South Bay Craft Beer & Bikes Bar Crawl. They have a stunning 88 beers on tap here, and all of them are from California! Given the decor (or lack of), intimidatingly long menu, and super knowledgeable bartenders, it’s clear this place is all about the beer. Fair warning: this place gets packed on the weekends and evenings. Naja’s Place does not have flights. Beer prices range from $7 to $9 a pint for most beers, and $8-$10 for specialties. After much discussion with the helpful bartender, I decided on the Stoutella from Knee Deep Brewing. The name says it all: a Nutella Stout! If you ordered the Peanut Butter Stout at Redondo Beach Brewing Company, expect something similar, but with a chocolate and hazelnut finish. My mouth is watering just remembering it. When you’ve finished your beer, hop back on your back and continue down the strand towards Hermosa Beach. The Hermosa Beach Pier boardwalk on a foggy yet beautiful day. Hermosa Beach is an adorable little beach town. The Hermosa Beach Pier is the main spot in town, and nearby you’ll find loads of excellent places to eat, drink, and shop. One weird quirk that I’ve never understood is that all of the street signs are in a sort of Lord of the Rings font, which is super adorable. A very long time ago, Hermosa Beach was a lot of farmland and barley, with herds of sheep and the occasional horse roaming about. Picture a sheep on the beach. How cute is that? The very first Hermosa Beach pier was built in 1904 out of, presumably, driftwood and dental floss. It quickly washed away and was replaced in 1913 with a much more robust version. Hermosa Beach has an average of 325 days of sunshine a year, and the rest of them are all misty, gray, and foggy. We can attest that it’s still really pretty, even in the fog. There is a Surf Hostel on the Hermosa Beach Pier! Check it out! Gnarly facts, bro. Your first stop in Hermosa Beach is a little bit before the pier and just off the Strand. Just a mad chill surfer bro statue in Hermosa Beach, California. Hang ten, dudes. It might be a little off the pier, but even locals agree: Hot’s Kitchen has the biggest beer selection in Hermosa Beach. Taps range from local selections to ubiquitous domestic beers and even some imports. You’ll find beer flights available, plus daily $4 craft beer “Dank Deals” (that’s what they’re actually called. You’re in Los Angeles, remember?). After Hot’s Kitchen, ride your bike to the Hermosa Beach pier and lock it. You’re hoofing it for a little while. Check out these quirky street signs! All of the street signs in Hermosa Beach have this incredibly cute little Lord of the Rings style font. Which I love because I’m a giant nerd. A block or two up from the Hermosa Beach Pier is Abigaile’s. Part craft brewery, part fine dining, part… punk rock? Totally, dude. It might sound like an identity crisis, but this place owns it. They serve up craft beers brewed in house (you’ll see the actual brewery equipment behind the bar! ), locally brewed beer selections from around Los Angeles and California, and incredible food like bone marrow, chicken and waffles, and goat cheese brussel sprouts. You know, the kind of stuff that make our foodie, hipster ears perk up. On weekends the place is packed with brunch goers, but by the time you arrive, they should have died down. Grab a seat at the bar to make it easier, and order a beer flight. This is a good place to grab some snacks as well (but save dinner for the next spot). Lia really likes the sausage stuffed fried olives. I, on the other hand, think olives are best served in the trash, so it’s your call. Everything is better when served on a California shaped wood slab. Especially locally brewed craft beer at Hook & Plow in Hermosa Beach, California. Blood Orange Amber Ale from The Dudes in Torrance, CA. Tastes like an orange creamsicle. The Patsy Coconut Rye Stout from Barley Forge Brewing Company in Costa Mesa, CA. A light bodied stout that tasted like coconut cream. Seafood Chowder: It has bacon in it and it’s amazing. Furikake House Fries: Truffle oil, seaweed flakes, parmesan, and incredible house made ketchup and mustard. 30H pulled pork sandwich: braised with craft beer, of course. Pear and burrata salad: with truffle oil and hazelnuts. Add scallops, too. Save dessert for another spot. Chill, bro – we totes gotcha covered. Fersh. These gorgeous old clocks on the pier, as well as beachy street art, add charm and character to quirky little Hermosa Beach, California. After your romantic moment of California happiness (peace and love, brother! ), hop back on those bikes and continue up the Strand towards Manhattan Beach. Redondo Beach has its docks and marina charm; Hermosa Beach has chill, grungy surfer vibes; Manhattan Beach is, by comparison, posh. It shares the same love of beach volleyball and surfing as its neighbor beach towns along the Strand, but it’s decidedly more upper crust. 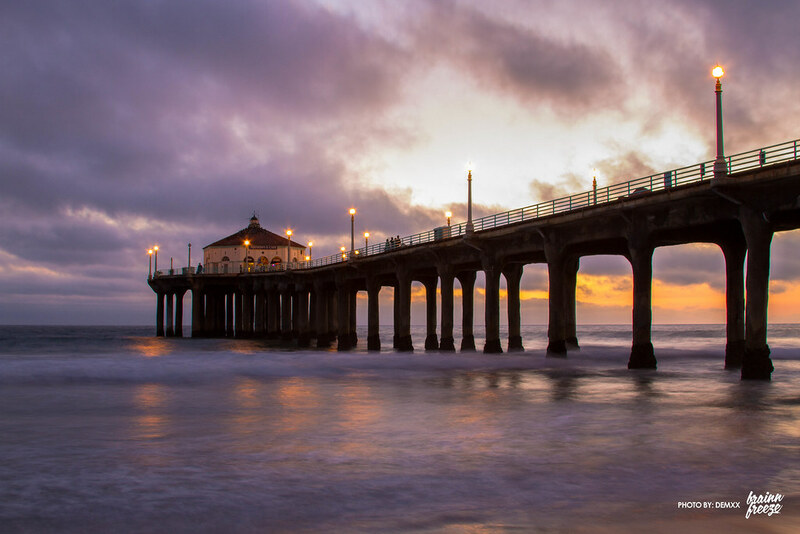 Its hilly downtown can be explored from the starting point of the gorgeous Manhattan Beach Pier. Their school districts are REALLY good. There’s like 8 different school rankings on their Wikipedia page. Speaking of their schools, Hannah Montana’s school was actually on location here in Manhattan Beach. You’ll catch views of the Manhattan Beach Pier in the show’s intro, too. Some other notable TV shows and movies filmed in Manhattan Beach: Starsky & Hutch, Tequila Sunrise, Veronica Mars, Jerry Maguire, Point Break, Against All Odds, and the video for White Walls by Macklemore. And a bunch more. The Beach Boys used to hang out and surf in Manhattan Beach, and they mention it in Surfin’ USA. Totes chill, dudes. Chyea! Anyway, park your bike at the pier and hike up the hill to the next stop. This is the Cali Creamin’ nitro vanilla cream ale. Its incredibly foamy head tastes like Butterbeer. SO good! The Nothing Imperial Stout from Smog City Brewing in Torrance, CA. Aged on raw cacao nibs. Dark and bitter. Just like my heart. What? I’m totes JK, dudes. Cali Creamin’ Nitro Cream Ale from Mother Earth Brew Co. in Vista, CA. This delicious vanilla cream ale has a frothy, creamy vanilla head that reminded me of Butterbeer (like, at Harry Potter world in Universal Studios. You know. The good stuff.) It was definitely one of our absolute favorites of the day. Down your beers and hit the street one last time for the very last stop on our craft beer bar crawl! The beer flight at Simmzy’s is served on a tiny surfboard, because of course it is. I love you, South Bay! Mocha Machine Porter by Beachwood BBQ from Long Beach, CA. Smells like coffee, tastes like coffee. Gypsy Tart Brown Sour by Bruery Terreux from Anaheim, CA. Flanders-style brown ale; tart, sour, dark and syrupy. You did it, bro! Celebrate your success by drunkenly inhaling a stuffed Apple Caramel Doughnut from Simmzy’s. Or, if you need a pick-me-up, stop by Manhattan Beach Creamery for a cupcake and a Cold Brew Nitro Float (that’s coffee with an ice cream float, not beer). The apple stuffed doughnut covered with salted caramel, chopped pistachios, and vanilla ice cream from Simmzy’s is incredible after a long day of drinking a ton of craft beer. Or like, anytime. Here’s a handy list of all the places along the Strand that you’ll be visiting on this self-guided craft beer bar crawl. But to make it even easier, we’ve compiled the entire post into a handy dandy FREE printable map with directions (and a Google Map, in case you’re more of a digital dude). I know, we’re the best, right? Sign up to below to have the map delivered straight to your inbox. Looking for even more amazing South Bay craft beer breweries? Local expert Craft Beer Guy has a comprehensive list of South Bay breweries! If you’d like to spend more time in Los Angeles, here’s a quick guide to Fun Things to Do in Los Angeles on Back Street Nomads, or the most Instagrammable places in LA, the home of Instagrammable things (and people!) on My Suitcase Journeys. Oh, and if you’re still hungry, check out some of the best tacos in LA on Bacon is Magic. Hey, we’d love to hear how your bar crawl turns out. Tell us all of your ridiculous bar crawl stories in the comments below! I love Craft beer. I need to do this when in California. Thank you! The Strand is one of our favorite places to ride our beach cruisers. And love the idea of making your own pub or food crawl. We did that once in SF where we rented bikes and rode from chocolate shop to chocolate shop! It was so much fun! That’s an awesome idea! Although the hills in SF make biking a much more challenging task. The Strand is quite a bit easier for a novice bike rider like me! This is an incredible and comprehensive list! Totally bookmarking this for the next time we visit there! This is such a great guide, I just wish I had read it before I was in CA last December! Thanks for the mention; cheers! Absolutely! Thanks for being an awesome resource! The link for map isn’t working, any idea why? You’re totally right, thanks for calling that to my attention! I removed the links. Instead, please use the forms to get your downloadable map. It’ll be sent right to your inbox!